The good and the evil are not equal, though the abundance of evil may dazzle you. We live in a time when the dazzling power of evil is so overwhelming that it has become the new normal. It is as if nothing has happened when we find our governments and their foreign policy is responsible for more than 150,000 people killed in Iraq (out of which 60% to 80% are civilians) and this is done in the name of spreading freedom and democracy (! ), while everyone know that the real motive is to steal cheap oil and gas from Iraq or Afghanistan. Billions of dollars of oil money is gone without trace and more and more innocent people are killed to ensure exactly that. In the new normal we are told to take it for granted that our true democracy and rights to know information can be systematically hijacked by those who have money and power and who would go all the way to commit every kind of despicable crimes against humanity to increase their profits. Some things you miss because they're so tiny you overlook them. But some thing you don't see because they're so huge. Out of individual and collective grand deception, the new golden calf that the entire world tend to worship these days is money and power. And in the process of worshiping - unimaginable oppression, injustice and crimes against humanity are being committed at this very moment as you read on by many of the regimes in the world, specially the powerful ones who continue to exercise new-colonialism across the globe. In this time we again and again come to stand face to face to the truth that politics is utterly filth and politicians are hypocritical beasts. In our contemporary time no one else does more "cover up" of truth than the politicians, especially that of the powerful countries and no one else is more hypocritical than them. And this is done by keeping grand smoke screens and unimaginable cover-ups. The truth will surface even in the face of total annihilation. In the last few months and again in the last few dramatic days, WikiLeaks, the most prominent whistle-blower website have made unprecedented revelations and creating world history. For every seeker of truth in our contemporary time this is an unforgettable turn of development and people of conscience can not help but extend their support for WikiLeaks and those who are behind the site. WikiLeaks is an international non-profit media organization that publishes submissions of otherwise unavailable documents from anonymous sources and leaks. Its website, launched in 2006, is run by The Sunshine Press. Within a year of its launch, the site claimed a database that had grown to more than 1.2 million documents. In a world where powerful elites are extremely busy committing countless crimes and unethical policies and at the same time get away with them by covering "the actual reality" from public - websites such as WikiLeaks functions a tremendously important role as an axis of truth, justice, accountability and above all as a resort for the often censored on going process that contribute towards massive crimes against humanity and towards the worst forms of injustice.The non-governmental organization Reporters Without Borders praised WikiLeaks past usefulness in exposing "serious violations of human rights and civil liberties"
Because of its valuable contribution since its inception WikiLeaks has won a number of awards, including the 2008 Economist magazine New Media Award. 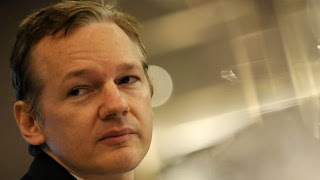 In June 2009, WikiLeaks and Julian Assange won Amnesty International's UK Media Award (in the category "New Media") for the 2008 publication of "Kenya: The Cry of Blood – Extra Judicial Killings and Disappearances", a report by the Kenya National Commission on Human Rights about police killings in Kenya. In May 2010, the New York Daily News listed WikiLeaks first in a ranking of "websites that could totally change the news". In April 2010, WikiLeaks posted video from a 2007 incident in which Iraqi civilians were killed by U.S. forces, on a website called Collateral Murder. In July of the same year, WikiLeaks released Afghan War Diary, a compilation of more than 76,900 documents about the War in Afghanistan not previously available for public review. In October, the group released a package of almost 400,000 documents called the Iraq War Logs in coordination with major commercial media organizations. The War Logs so far are one of the most important source of evidences based on ground facts that America and its allies have committed and continues to commit war crimes at a massive scale and worse even, covering them up on a regular basis. Publishing improves transparency, and this transparency creates a better society for all people. Better scrutiny leads to reduced corruption and stronger democracies in all society's institutions, including government, corporations and other organisations. A healthy, vibrant and inquisitive journalistic media plays a vital role in achieving these goals. We are part of that media. In the years leading up to the founding of WikiLeaks, we observed the world's publishing media becoming less independent and far less willing to ask the hard questions of government, corporations and other institutions. We believed this needed to change. WikiLeaks has provided a new model of journalism. Because we are not motivated by making a profit, we work cooperatively with other publishing and media organisations around the globe, instead of following the traditional model of competing with other media. We don't hoard our information; we make the original documents available with our news stories. Readers can verify the truth of what we have reported themselves. Like a wire service, WikiLeaks reports stories that are often picked up by other media outlets. We encourage this. We believe the world's media should work together as much as possible to bring stories to a broad international readership. 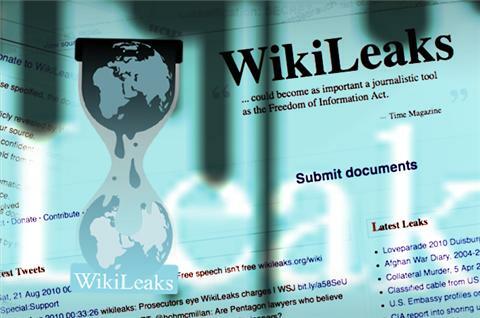 As part of its great service towards truth, in its revelation Wikileaks began on Sunday November 28th publishing 251,287 leaked United States embassy cables, the largest set of confidential documents ever to be released into the public domain. The documents provide direct access to people around the world an unprecedented insight into US Government foreign activities - which often is called as "juggernaut of evil" by those who know the actual reality of the situation. The cables, which date from 1966 up until the end of February this year, contain confidential communications between 274 embassies in countries throughout the world and the State Department in Washington DC. 15,652 of the cables are classified Secret. The cables show the extent of US spying on its allies and the UN; turning a blind eye to corruption and human rights abuse in "client states"; backroom deals with supposedly neutral countries; lobbying for US corporations; and the measures US diplomats take to advance those who have access to them. This document release reveals the contradictions between the US’s public persona and what it says behind closed doors – and shows that if citizens in a democracy want their governments to reflect their wishes, they should ask to see what’s going on behind the scenes. In releasing the secret, classified and confidential US Diplomatic cables WikiLeaks has bare open the covering up and hypocritical nature of the power elites of the world. In her column Ariana Huffington writes, "... here is what makes the leaked cables so important: they provide another opportunity to turn the spotlight on the war in Afghanistan, which, despite the fact that it's costing us $2.8 billion a week keeps getting pushed into the shadows -- even in this deficit-obsessed time. The cables are a powerful reminder of what this unwinnable war is costing us in terms of lives, in terms of money, and in terms of our long-term national security." What no one says, including Ariana is that both the War that America is fighting along with NATO and allies is that they are unjustified war based on lies and deceit and have caused and continues causing war crimes and crimes against humanity. Falsehood is ever destined to perish! It is unprecedented history in the making of our time and anyone who is a seeker of truth and who understand the spiritual principal that truth must not be "covered up" (kufri, denial / rejection / concealing of truth). Covering up of truth (any truth that is) is one of the worst crime from spiritual vantage point. Those who actively strive in seeking the truth and who contribute towards unveiling the covering up of truth is indeed warrior of light of our age. We no longer live in the age of medieval chivalrous knights, but in our time, the new trend of activism that utilizes "New Media" to uncover truth, are the new activism of Chivalry which is to take the side of the oppressed and to speak out the truth. The Knight Code of Chivalry included: "To protect the weak and defenceless, to fight for the welfare of all, to eschew unfairness, meanness and deceit, at all times to speak the truth." And what the people behind the WikiLeaks are doing is no less than an act of great spiritual service for the truth by uncovering unjust, oppressive and wrongful actions that contribute massive suffering to not only one generation but many to come and the price that is going to be paid will be taxed upon multiple generations, including our. The greatest movement (Jihad/struggle) is speaking the truth in the face of an oppressor. Julian Assange, Journalist, Internet Activist and Editor in Chief of WikiLeaks is probably the most brave truth seeker of our time. He has put his own life at great risk for the sake of uncovering something which are systematically have been covered up, abused and have become cause to kill and maim millions of people in the world. Such truth are absolutely necessary to be unveiled in order to prevent massive crimes against humanity. US government and its apparatus have gone mad over the fact that their hidden agenda and how they operate is made public partially - and they are threatening every kind of threats including the possibility of labeling WikiLeaks as terrorist organization. The Interpol has already issued red notice and arrest warrant against Julian Assange, the brave organization head of WikiLeaks and there are real possibility that he might be assassinated by secret agents of worlds most powerful countries. To radically shift regime behavior we must think clearly and boldly for if we have learned anything, it is that regimes do not want to be changed. We must think beyond those who have gone before us, and discover technological changes that embolden us with ways to act in which our forebears could not. Firstly we must understand what aspect of government or neocorporatist behavior we wish to change or remove. Secondly we must develop a way of thinking about this behavior that is strong enough carry us through the mire of politically distorted language, and into a position of clarity. Finally must use these insights to inspire within us and others a course of ennobling, and effective action. - Julian Assange, "State and Terrorist Conspiracies"
In our contemporary time most of the news channels and outlets are so commercialized that they work only as spoke-puppet which makes independent sites such as WikiLeaks so important. As John Pilger writes, "The WikiLeaks revelations shame the dominant section of journalism, devoted merely to taking down what cynical and malign power tells it. This is state stenography, not journalism." In the Matrix film, the protagonist Neo was allegedly the chosen One, whose destiny was to attain freedom from the system and dismantle it, There have been real life heroes in history trying to change its course. Dr. King, Malcolm X and John F. Kennedy revealed that their destinies were to fight against an unjust system. They were heroes that showed a way to imagine a new future. Yet one by one they disappeared from sight. I saw apathy and cynicism spreading in people. I saw the armored shell of fear that many so often put around themselves. It became harder to strive for something higher, as if the death of heroes killed something in them. I realized how important it is to do something. What can be overwhelming is to realize how so many of our problems have become transnational, especially in light of how the interlocking world economy is teetering on a precipice. Today with the WTO and NAFTA, corporate power has extended its reach beyond borders, transforming economies, cultures and nations on their terms. The Matrix is global, expanding into and transforming whole cultures, consuming local and state economies with debt and monetary control, plugging them one by one into a kind of blood-sucking machine. The job of the media is not to protect the powerful from embarrassment. It is for governments – not journalists – to guard public secrets, and there is no national jeopardy in WikiLeaks' revelations. "We need to prepare ourselves, for the possibility that sometimes big changes follow from small events, and that sometimes these changes can happen quickly... Look at the world around you. It may seem an immovable, implacable place. It is not. With the slightest push -- in just the right place -- it can be tipped." - wrote Malcolm Gladwell in The Tipping Point - may WikiLeaks be one such tipping point towards the liberation of truth from the cover ups and manipulations. WikiLeaks are the most important truthsayers of our time and every truth seeker must offer their support for it. It is our moral obligation for every people of conscience to step forward with support, resources and contribution for the protection of Julian Assange and his colleagues, whose truth-telling is as important as any in our lifetime. Long live WikiLeaks and may all the oppression, nation sponsored mass murder and deception come to an end, may all war crimes and crimes against humanity come to halt. War is the most uncivilized act and its long over due that we progress towards true justice, true freedom to ensure a truly peaceful and enlightened humanity without discrimination. * Wikileaks: Why is our press ignoring an important story? * Transparency will be the first casualty of the WikiLeaks State Department revelations. 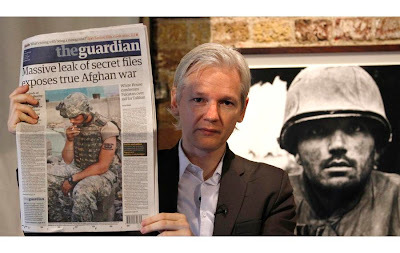 WikiLeaks Founder Julian Assange on Iraq War Logs, "Tabloid Journalism" and Why WikiLeaks Is Siege"